There was no screw in the depth bar guide part, and the part was also attached with the hobbler. How much is such a quality standard saying that it is made in China? 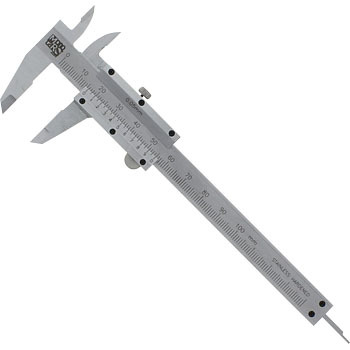 Because it is a measuring instrument, roughness should be improved. It is likely to wear out immediately after the slide is rough. This review is about item#6790655. I bought three books. The first one works hard so smoothly that there are other reviews as well. The second one was painted with lubricant in large quantity, and the hand became tacky. Although it is difficult to explain the place, there is a place where it hurts when you touch it with no corner R. The third one did not even bother to open it. It is a very disappointing commodity. This review is about item#06790655. If you use it as soon as you open it, the depth is 0.3 mm crazy, and the first round of rough processing makes the dimensions insufficient and it's OK. It was super dented. It was repeat purchase. It was about 6 years ago. When purchasing last time it was a perfectly accurate product, but this time the product is not a measuring tool. Even the cutting edges do not line up, do not move smoothly, there is no way to get accurate. The body part was tapered and rattled, the gap between the memory part and the torso was too much, it was twisted, the hand was cut with full of bali, caught by the chips, it was hard to repair. I will not buy it anymore. The movement is bad, and it is not possible to expect a system of 1/20 mm without moving the mouth when it is closed. It can be used without difficulty if measuring 1 mm unit! There is a feeling of being caught, and the movement is bad. There is a deviation of 0.1 to 0.2 in the completely closed position. It can not be adjusted even when disassembled. There is no influence on the measurement, but the part that hits the finger of the slider is not mounted in parallel, it is bent. There is no problem because it is not used for precise work, but it is not a pleasant one. It may be that it happened to be out of the way, but because it should be able to buy more accurate things due to the difference of hundreds of yen, it may be a good idea to think a little. · The entire product is sticky and sticky and not sticky and anti-rust and sticky are sticky with lubricant · It is hard when you pull it with both hands. It will not open even if you unlock it. I can not use it with one hand because I can not open it. (Although it will be better if you use it for several years it will be better) · Scales are not engraved (disappear immediately), some of the printing strikes the disappeared objects, the scale disappears when you touch it many times I will. · Zero state indication is out of order · adjustment of graduation board is necessary by shifting the scale plate with a watch driver · meaningless case scales disappear as it may be a case month It is 500 yen in a home center caliper made by Shinwa with calendar scale with engraving printing Also high. Compared to it, it is less than half price equivalent. Even if an individual uses it on a do-it-yourself carpenter, if you put it in a tool box, the scale will disappear and it will disappear. Is it disposable ??? When I opened the case for the first time after delivery, the caliper was in a plastic bag, but at that time it was covered with oil and I thought it was already "huh?" Is it such a thing? Even if the oil is cleanly wiped off, you can not wipe it off Does anyone in the middle still have oil? Every time you slide it, the side is dirty and oil is also attached to your hands. Since we measure the paper, the calipers themselves are dirty with oil and dirt is transferred to the paper, so it was a sorry commodity. It is a commodity which is satisfactory also without the oil if it is price. Measurement accuracy is reasonable, but finishing of the slide part is the worst. It is very hard to use.